The Puma Multi-Strategy EPS is a discretionary portfolio service providing access to a range of strategies that intend to qualify for Business Relief (BR). 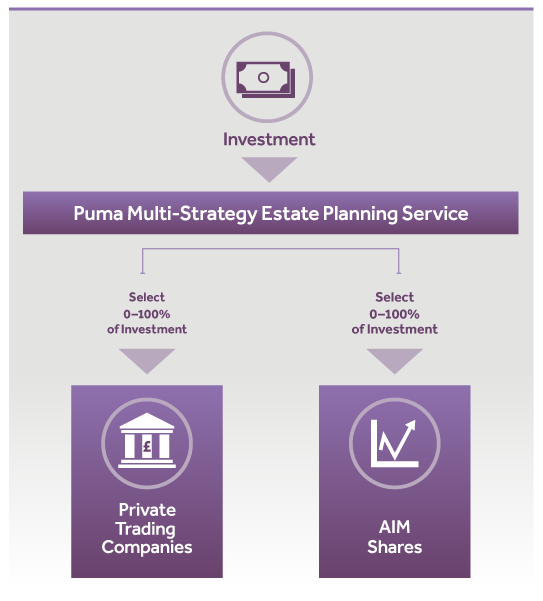 The Service provides a range of solutions to cater for varying return and risk profiles, drawing from Puma Investments’ deep expertise across the spectrum of BR qualifying investments, from Private Trading Companies, through to investments in AIM Shares managed by Puma Investments’ award winning AIM Team. The Puma Multi-Strategy EPS carries risk – see Risk Factors below. Optional two year life protection available to mitigate the potential impact of IHT in the first two years. Investors can choose to invest in either Private Trading Companies or AIM Shares, or in a combination of the two strategies. We understand that when it comes to estate planning, you want to carefully safeguard your investments from IHT. Even when investing in BR qualifying investments, IHT relief is not available until after an initial two year holding period. With the Puma Multi-Strategy EPS, you have the option to protect yourself from IHT during the initial two year holding period. Puma Investments has taken out a group policy to provide you, for a fixed additional cost, with the peace of mind that should you die within two years of your investment in the portfolio companies, an amount equal to 40% of the investment will be paid. Provided that the Insurer settles the claim and pays the proceeds to Puma Investments, we will pay the proceeds to the investor's beneficiaries, taking into account the investor's expression of wishes. The Service offers the investor the opportunity to invest in Private Trading Companies. Through the Service investors may choose to invest in a portfolio of AIM listed companies, managed by Puma Investments’ award winning AIM Investment Team. Puma Investments is part of Shore Capital, an AIM listed company itself, with a 32 year history. An investment in the Service carries risk and may not be suitable for all Investors. Investors can only invest in the Service through a Financial Adviser who has assessed that an investment in the Service is suitable. Past performance is no indication of future results and share prices and their values can go down as well as up. Tax reliefs depend on individuals' personal circumstances, minimum holding periods and may be subject to change. An investment in smaller companies is likely to be higher risk than other investments. Investor's capital maybe at risk and Investors may get back less than their original investment. An investment in the Service should be considered a long-term investment. Private Trading Company Shares and AIM Shares are illiquid. They are characterised by significant spreads and low trading volumes. It may prove difficult for Investors to realise immediately or in full proceeds from the sale of such Shares. Life Protection for Puma Multi-Strategy is subject to certain conditions, if these conditions are not met in full then Puma Investments will not be paid out and so no payment will be made to beneficiaries.